Get the latest updates from the Links at Dover Coast on these pages. 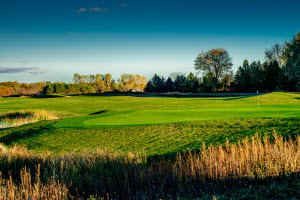 Golf course hole updates, golf club updates, league information updates -- stay up to date. 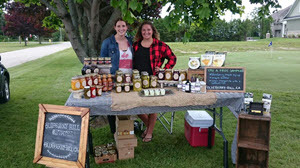 Drop by The Links at Dover Coast during the 2019 golf season for a taste of locally sourced cuisine from David's On Tour award winning food trailer! Open Tuesday through Friday 11am - 8pm! Weekly All Day Features, as well as a set menu, available to golfers & the Public! The Champion Penguin of the year! 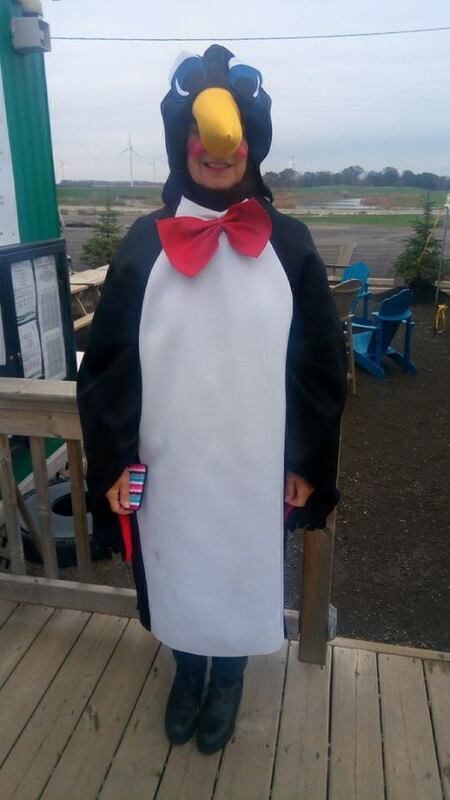 Congratulations to Margie Parkes on winning the best costume on our annual Golf Day! 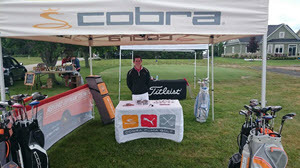 What a Club Championship this past weekend! The Senior title went into a two man playoff and was won on the second playoff hole #14. Congratulations to all participants and winners in surviving the hot temperatures! 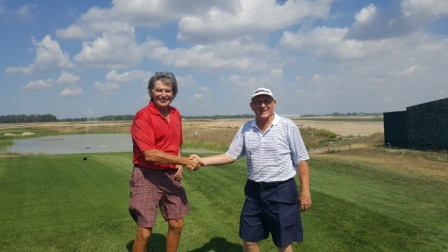 It is with tremendous pride that we announce that The Links at Dover Coast has been officially rated by Golf Ontario and by the results, the design is a testament to the goal of setting out to build a course that is fair to the uninitiated but a challenge to the seasoned. Our Course Ratings range from a low of 120 to a high of 142 making this a very accessible course all the while being highest rated challenge of golf in the region. Now get out for a round! Amelie Chanda of Norfolk County Tourism dropped by The Links at Dover Coast on May 18th to do a live podcast! Amelie is the Active Living Ambassador of #GoNorfolk. Watch as she tours the golf course with Manny Borges, Golf Manager/Golf Professional at The Links at Dover Coast, and visits with members during a Thursday Night Mixed League shotgun match. Amelie & Manny discuss the community & how to get active by joining a golf league. See the semi-private golf course first hand as Amelie walks the course! Stay up to date with The Links at Dover Coast on Facebook! What a beautiful sight this morning! Seeding of holes 10 & 18 has begun! Let the 9 hole parade commence!!!! 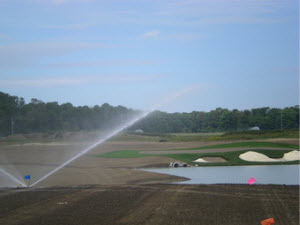 Water pumping through the sprinklers?......Check! Having a Superintendent (Rick Buttenham) who really knows what he is doing?.....PRICELESS!!! What a difference a week makes when you irrigate the course none stop! A beautiful site! FINALLY!!! The day has come to pump water from Lake Erie into our ponds. Massive irrigation will commence on the entire course! Green plush course here we come!!! Well that didn't take long....Our 2nd annual Divorce Open is now sold out! 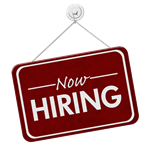 We do have a waiting list if you would still like to register. Congratulations to the first ever hole-in-one at The Links at Dover Coast. This feat was accomplished by Carol Bailey on Friday July 29th on the 12th hole from 125 yards! Join us every Tuesday from 7am until noon for Senior's Tuesday's! Join us on Saturday April 30, 2016 for a one day Open House at The Links at Dover Coast and learn more about the newest golf offering in Norfolk County! Construction of the Pond on the 9th hole is underway! 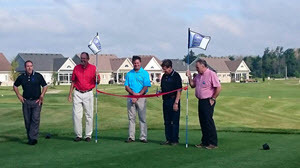 On July 1, 2015 The Links at Dover Coast held its Grand Opening Ceremony. Below are some photos from the memorable day! 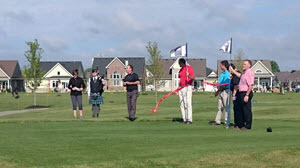 Join us on July 1, 2015 as we celebrate The Links at Dover Coast Grand Opening! The Opening Ceremony begins at 9am and is followed by an outdoor bbq, vendors, and live music by The Dudes! We will be offering 2 for 1 green fees and cart rentals, as well as Bocce Ball and a Pickleball clinic. Drop by David's Restaurant and purchase tickets to enter our draw for a chance to be the first foursome to play the Links! Tickets are $5.00 each or 5 tickets for $20. We will announce the winner on June 27th. 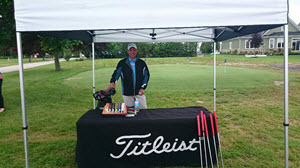 When teeing off on the first tee, participate in our tee challenge! Proceeds will go to the Alzheimer's Society of Haldimand Norfolk! Links at Dover Coast is pleased to launch its new website, just in time to invite members of the community to book their tee time online. July 1, 2015, Links at Dover Coast will be officially open for golf. The Links at Dover Coast website not only provides information about the beautiful golf grounds, it also enables golf enthusiasts to book their tee time, half round, or full round, for 2, 3 or 4 people. The Links at Dover Coast Golf Club season in 2015 will be from July 1st to season close. The website also enables Pickleball players to book their courts online as well. 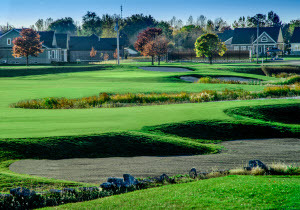 Links at Dover Coast is just one of the premiere amenities that is part of the Dover Coast Adult Lifestyle Community which also include Elements Day Spa, David’s Restaurant, and the Double Olive Lounge. The website was developed by Farms.com Professional Services. The South Coast Shuttle Bus Service stop is at David's Restaurant just across the street from Links at Dover Coast. On Saturday and Sunday, as well as on holiday Mondays. Fares are $2.00 one-way in town or $6.00 one-way out-of-town. Detailed shuttle bus information including the schedule for the South Coast Bus Service linking Port Dover, Vittoria, Normandale, Turkey Point, Port Rowan, and Long Point. Pickleball courts are available now. You can book a pickleball court by calling the pro shop. 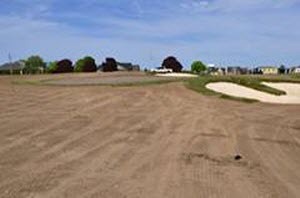 #14 - View from tee deck side of ravine - seeded with fescue mix in foreground, next is waste bunker then mounding out of waste bunker to fairway grade - approximately 450 yards from green - tee deck system elevates 6 meters above fairway grade and length of hole from back deck is 605 yards. #13 - standing on the tee deck system for #13. This area has been raised by 9 metres. In the distance your sightline is to the south directly at Lake Erie. 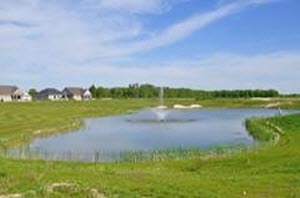 On the left is the 3.5 acre pond with the golf hole playing around behind the south side of the pond. From the tips the hole plays 360 yards in length. The infrastructure is such that all drainage for the 17th hole flows into this pond as does #12 and 13. An 8" overflow line maintains a constant pond level with overflow going to the main irrigation pond on #14. 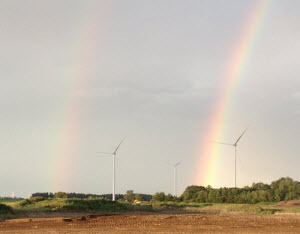 Another way for us to use on site water to its fullest extent. #17 Green. Shaped and graded this green has 3 distinctive regions that will benefit the golfer hitting the location and penalize you if you happen to be on a separate tier. In the distance is the future area for #10 and #18 as we head north to highway 6. #12 Green and fairway - in the foreground the green is shaped - in the distance is the tee deck system. 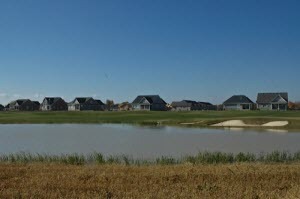 On the right is the east side of the 3.5 acre pond. This par 3 will play 190 yards from the tips with a full green front side bunker protecting the green surface. #11 Fairway - a 3 meter cut is started working to the left (the north) toward the tee deck system. 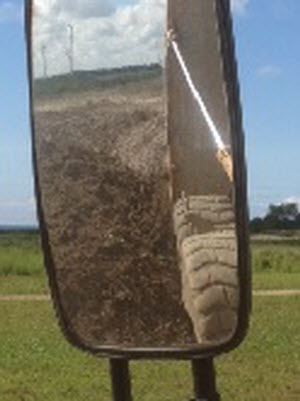 Your tee shot will be played to the approximate location of the rock truck you see in the image. From there you will be hitting over an open ravine to an elevated fairway structure and green. The hole plays 455 yards with a forced layup at about 180 yards. #18 tee - yes, we are that far. This tee deck system is 3 metres above grade. Aiming to the north #18 plays 530 yards and will lead to the future Hotel/Conference Centre complex. 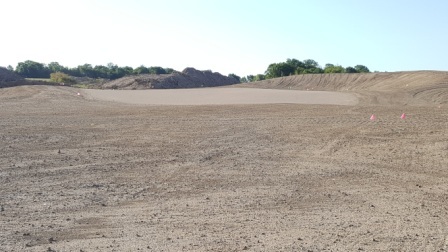 During the winter of 2013 - 2014 we will be striping the topsoil from this area to sculpt numbers 10 and 18, as well as the start of the excavation of another 3.5 to 4 acre pond. Have we been busy! - Or shall I say, has Bill & Kurtis been busy! We have done extensive work including the completion of #14 with drainage and 80/20 greens mix. The irrigation is near completion. 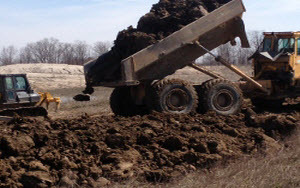 We have begun sculpting hole #17 and have made tremendous efforts with the excavation of #13 pond. The weather has cooperated for the most part in the latter part of June and July and have had a great start to August. 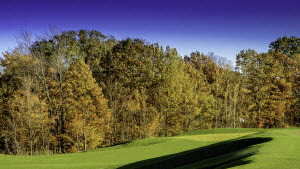 Our intent is for fall planting of holes #14 and #17. 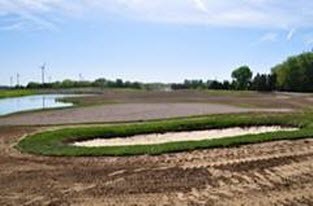 We have also added holes #11, #12 and #13 to our list for late season seeding. Mainline drainage from #17 to #13 Pond. Rain events have been the order of business through the month of May - beginning in the latter part of May during which time we had a site visit from Darrell Huxham (below in red) and meeting with the golf shaping contractor (Connell's Construction) from Peterborough, Ontario; we began in earnest, the shaping of hole #14. 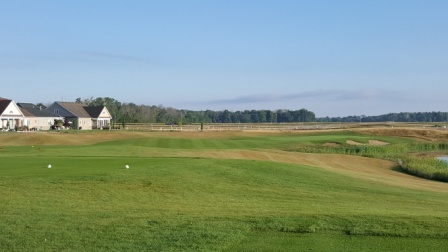 #14 is a significant hole for the course, a 600+ yard par five with vistas over looking Lake Erie, the hole plays along our 5 acre irrigation pond and is adjacent to New Lakeshore Road. Darrell Huxham (in red) and Bill Connell (in brown) are seen here at the back tee deck for hole #14. Site lines, tee deck shape and size are being staked as is the cart path locations. The general aesthetic is also being discussed to ensure the design and vision of Darrell's plan are being communicated. A few things can be derived from this image - note the clay stuck to Darrell's boots. As mentioned earlier, rain fall was considerable during the month. 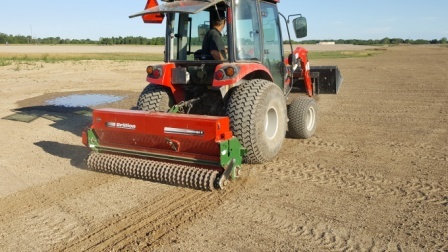 This caused some delays in shaping schedules as the terain was too soft for heavy equipment. 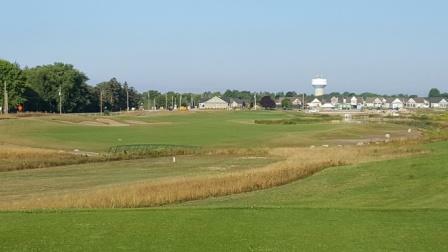 This photo is taken from behind the tee deck system on #14, in the distance on the right is the irrigation pond which will come into play on your second shot and approach shot to the green. 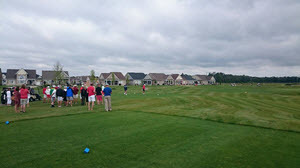 In the distance on the left the building is the approximate location of the green for #14. Ah - some blue skies. Having had a couple of days of sun and wind, the ground has dried enough for us to get out and shape. In the background is the tee deck system and burm system for #14 - the excavator and tractor are doing the final contour shape on the tee deck side of the ravine which seperates the tees from the fairway on #14, in the foreground material is being shaped for the fairway landing area for #14. This photo is taken from approximately 100 yards from the green on #14. The small tractor and dump trailer are on the extreme right of the green surface. Greens drainage is being installed. 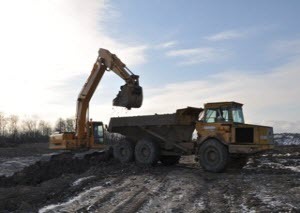 With significant precipitation as of late we unfortunately have lost 2 weeks of excavating. Dry and chilly conditions this past weekend has permitted us to get back out today. Here we are taking down the north side edge of #14 by 1.5 metres to accomodate an extensive "beach bunker" which will lead to the irrigation pond on #14. 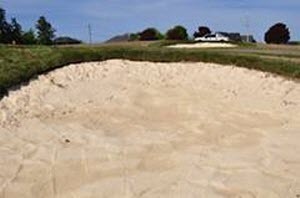 The material (the second photo) is then brought to the south side of #14 for the back support of a fairway bunker approximately 300 yards from the tee deck sets. 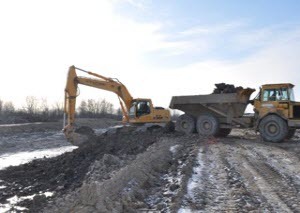 Currently we are in the process of excavating a 3.5 acre pond which will be a significant water featured surrounded by holes 11, 12, 13 and the tee off at 14. 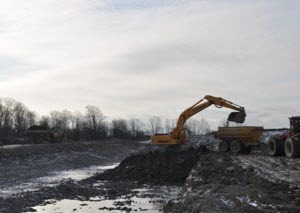 The images below provide you with a sense of the magnitude of the pond excavation in this area. 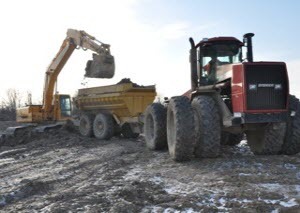 Progressing well, approximately 3/4 of this pond has been excavated with the material being used as the subsurface for holes 11, 12 and 13 as well as for the mounding seperating these holes from number 17 green. 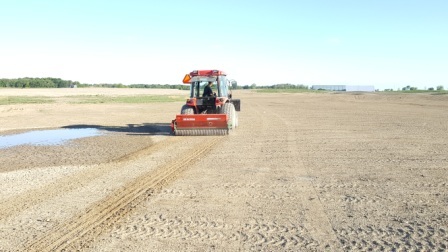 Once rough sculpted, the area will be fine sculpted and resurfaced with topsoil in preparation of irrigation and seeding. The completed construction of these holes with the currently completed holes move us closer to our intended opening in the spring of 2015. 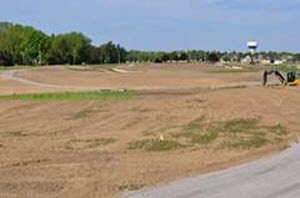 Work is set to continue on the golf course. Heavy machinery has been arriving all week. 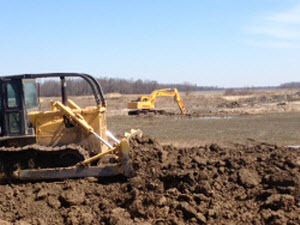 The crew is preparing to begin excavation of a 55,000 cubic meter pond. Holes 11, 12 and 13 will be shaped around its perimeter and feature a stadium style mound 5 meters high. Our own little amen corner should begin to take shape by early April. 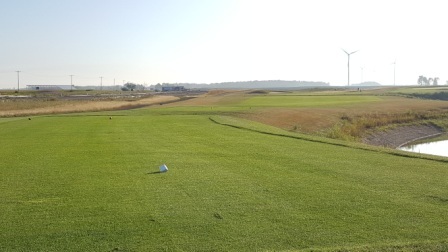 At Dover Coast we pride ourselves on the visual attractiveness of each hole whereby the golfer will be stimulated at every tee box and presented with play options and fair exciting challenges. Elements such as risk-reward shots and heroic shots combined with large water features are elements we include within the overall design to further stimulate the golfing experience. Sod and seed have been put down and three of the large ponds have been filled allowing us to begin irrigating ! Exciting news for the residents that will be soon moving into their homes overlooking the golf course.